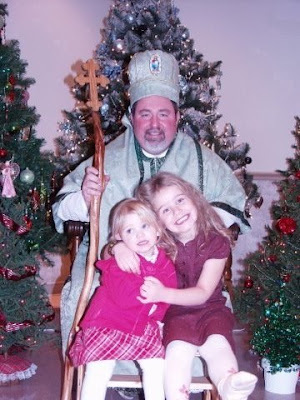 A picture of the girls with St. Nicholas at the celebration at St. Mary's in Merrillville. We thought the girls would be shy - especially without their cousins who were home sick - but both girls kept inching closer as he spoke about the life of the precious Saint who sacrificed his inheritance for those in need around him. Granted, Isabelle particularly, remains somewhat confused about the details (does St. Nicholas have a sleigh?, etc.) but I feel, at least, that we're moving in the right direction! That picture is...fantastic! I am so glad they had fun. Right direction...as we all should face! They are really precious little sweeties!